Amid the echo chamber of dissent surrounding the Jeremy Lin signing, there’s a very interesting historical question that hasn’t really been answered. As sports fans, we often want to believe that we’re seeing something new and fresh, something that’s never happened before. The reality is that most things we see have happened before and will almost surely happen again. The last nine months of Jeremy Lin’s career, though? That might actually be unprecedented in the history of American sport. 1. A player at the beginning of his professional career without any status as a top prospect was acquired by a team off of the waiver wire/from the free agent market as freely available talent. 2. That same player promptly played at an elite level for a portion of exactly one season. 3. That player departed the team during the subsequent offseason. This unique scenario applies to Lin, whom the Knicks acquired off waivers from these same Rockets on December 27. Lin promptly put up a 19.9 PER in 35 games with the team, the 35th best rate in the league for a player with his minutes. And, of course, Lin is now on his way to Houston for the upcoming season. The problem in finding a comparable situation in the past is that the Lin saga combines two sets of events that almost never happen together. It’s extremely rare for a team to acquire a young player from the scrap heap for nothing and see him blossom into a superstar, and it’s even rarer for a team to have a young player perform at an elite level for any period of time and promptly let him go during the following offseason. When I posed this question on Twitter, I got about 8,000 responses. By now, you’ve probably come up with a few players who might meet one or even two of the criteria. Chances are your pick doesn’t fit all three, though; I could only come up with one player who came close to fitting all three of the criteria, and even his candidacy involves a little bit of cheating. Let’s go over some of the more common answers and point out why they don’t fit. Wesley Matthews joined the Jazz as a rookie free agent and left for the Blazers after one season, but he played the full campaign and only posted a 12.3 PER. Even if you’re not a slavish devotee to PER, it’s hard to suggest that he was anywhere near as valuable as Lin was. Chris Childs broke out during the second half of the 1995-96 season and immediately left the Nets for the Knicks, but he played 131 games for the Nets over a two-year stretch. Chris Webber only lasted a season with the Warriors before being traded to the Bullets in 1994, but he was also the first overall pick in the draft. Dan Dickau had an unexpectedly decent run for the Hornets in 2004-05 and left for the Celtics in the offseason, but he posted a league-average PER of 15.0 during that stretch. Put it this way: He wasn’t getting any MVP chants. Billy Ray Bates had that stunning run for the Blazers in the 1979-80 season, but he stayed with Portland for three years before being released in 1982. The Backup Quarterback of Your Choice doesn’t fit the criteria because virtually every backup spends years in a system before getting his chance to play well after an injury or a benching. That’s why the likes of Matt Flynn, Scott Mitchell, and Matt Cassel don’t apply. You can also argue that they didn’t play at a level similar to Lin. Kurt Warner played at that level and came out of nowhere, but he had spent the previous season on the Rams bench and stuck around in St. Louis for a number of years afterward. And no, Tim Tebow doesn’t remotely fit the criteria. Timmy Smith is famous for his 204-yard game in the Super Bowl against the Broncos in 1988, but he produced a mediocre 470 yards on 155 carries for the Redskins that year. Laurent Robinson certainly fits criteria two and three, but he had established himself as a mediocre receiver over some pretty significant playing time during the first four years of his career before having a breakout season in Dallas last year. Lin had just 285 pro minutes for the Warriors in 2010-11 before breaking out over a 940-minute stretch with the Knicks last season. As it turns out, the best comparison I can find to the Jeremy Lin story in sports is Josh Hamilton with the Reds in 2006. You can disqualify Hamilton on the basis of his being the first overall pick of the 1999 draft, but Hamilton’s struggles with addiction had basically led to his being written off as a bust with no hope of delivering on his draft status. Hamilton didn’t play organized baseball from 2003 to 2005 and posted a triple-slash line of .260/.327/.360 at A-ball Hudson Valley in 55 at-bats during the 2006 campaign, so it’s hard to argue that his prospect sheen was still showing. In fact, he wasn’t even the first pick of the Rule V draft that year; he went third overall to the Cubs and was traded to the Reds for cash. And there, Hamilton posted a 131 OPS+ in 90 games before being traded to the Rangers for Edison Volquez. It might be easier to find stories comparable to Lin’s in the world of entertainment, since greatness is a more arbitrary construct there. 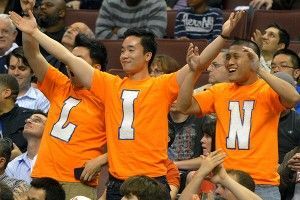 Musicians like Brian Eno (Roxy Music) and Henry Rollins (Black Flag) spent too long with their respective groups to be fairly compared to Lin’s lightning-quick tenure with the Knicks. A better example is probably Ice Cube, who was an essential part of one legendary album with N.W.A. before launching his solo career almost immediately thereafter. In terms of television, the best example is probably, as suggested on Twitter, David Caruso, who had a single season as the star on NYPD Blue before leaving the show for a movie career. And if Lin follows the Caruso path, well, Knicks fans can expect to see him back to making endless one-liners on the court sometime around 2017.